There has been a bit of a buzz in the Outlander world about eye color recently. In particular, many are questioning the eye color of Brianna. How can two blue eyed parents (as are Jamie and Claire on the Starz production of Outlander) have a child with brown eyes? People have two copies of most of their genes. One copy is inherited from their mother and one copy from their father. These genes come in different versions, or flavors, called alleles. In the book series, Claire has whiskey colored (brown) eyes, Jamie’s are blue, as are Brianna’s. Recalling our high school biology days, we know that blue eyes are a recessive trait. To have blue eyes, a person must inherit two copies of the recessive gene. Claire must have carried Bb (a dominant and a recessive) and Jamie carried bb (both recessive), and Brianna inherited a recessive (blue eyed) allele from each parent, giving her bb. On screen, both Claire and Jamie have blue eyes and their daughter has brown. Doesn’t this go against what we all learned about eye color inheritance in high school biology class? As it turns out, eye color is not nearly that simple. There are a number of genes influencing eye color, but two in particular are known to play a significant role in the the development of blue or brown eyes. These are the OCA2 and HERC2 genes located on chromosome 15. The OCA2 gene determines how much pigment is made, not only in the eyes but in the skin and hair as well. Lots of pigment results in brown eyes. Blue eyes are the result of little to no pigment in the eyes. Lying next to the OCA2 gene on chromosome 15, the HERC2 gene functions much like a switch, controlling how much expression the OCA2 gene will have and thus how much pigment will be present in the eye. It is thought that originally, all humans had brown eyes, and a single mutation in the HERC2 gene created this “switch,” leading to the development blue eyes. It is now believed that all blue eyed people descended from one common ancestor who developed this mutation! If a person inherits two “h” copies of the HERC2 gene, it doesn’t matter what eye color the OCA2 gene carries. The switch is turned off and expression of the OCA2 gene is limited. Little to no pigment is produced and blue eyes result. Thus, a parent with blue eyes can carry the trait for brown eyes if they carry the OO or Oo version of the OCA2 gene, but with the mutated gene (hh) “switching off” the OCA2 expression. Even though their OCA2 gene would signal the production of a lot of pigment, and thus brown eyes, the switch is off and little to no pigment is made. The eyes are blue. Brown eye color in the offspring of two blue eyed parents is not a common phenomenon, but this is the Outlander world, after all. Questions? Comments? 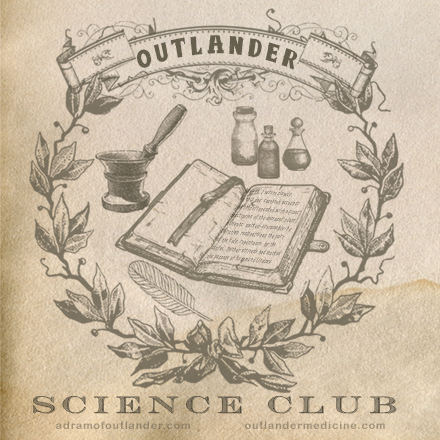 Suggestions for future Outlander medicine topics? I’d love to hear from you! Leave a comment here or connect on Twitter or Facebook!